10-inch High definition display shows colorful, fresh, and compelling visuals from music videos and TV shows. The Echo Show screen is complemented by dual, side-firing 2-inch Neodymium drivers, a passive bass radiator, and Dolby processing to deliver expansive sound with deep, powerful lows, and crisp highs, perfect for listening to your favorite music. Amazon announced the Echo Show to add to the wide range of Echo devices available in India. 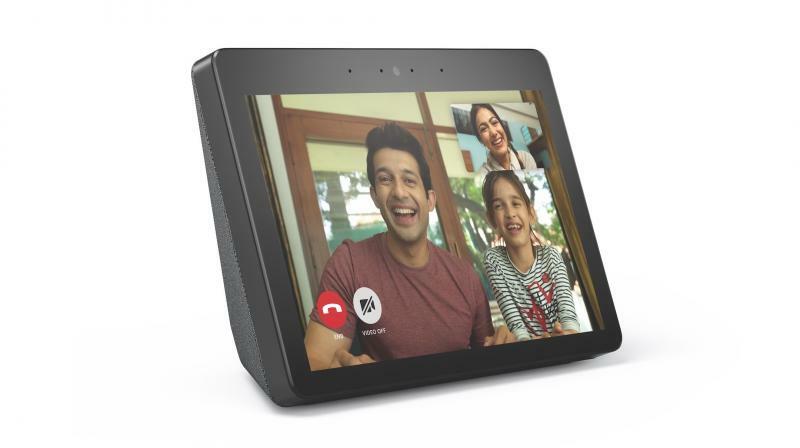 Echo Show, which comes with an immersive 10-inch HD display, crisp and bright visuals, a built-in smart home hub and a speaker system with Dolby processing that delivers powerful bass and stereo sound, is available for Rs 22,999 on Amazon.in and select retailers. The Echo Show has an eight-microphone array and ‘far-field’ technology to differentiate your voice from ambient sound. The Echo Show screen is complemented by dual, side-firing 2-inch Neodymium drivers, a passive bass radiator, and Dolby processing to deliver expansive sound with deep, powerful lows, and crisp highs, perfect for listening to your favourite music. Just ask to play Amazon Prime Music, Saavn, Hungama Music, Gaana or TuneIn. Adjust the treble, mid, and bass levels using only your voice, or set up multi-room music to play music across compatible Echo devices throughout your home. With a built-in Zigbee smart home hub, the Echo Show makes it simple to start your smart home. Just say, “Alexa, discover my devices” to automatically discover and setup compatible light bulbs and plugs without the need for additional hubs or apps. Once set-up, ask Alexa to turn on the lights or use the touch-screen to turn devices on and off. You can use Alexa-compatible cameras to view a live feed from a camera location without lifting a finger. Just say “Alexa, show the kids’ room.” You can also use Alexa Routines to complete multiple tasks, from controlling smart home devices to playing music and getting news information, with a single voice command. Echo Show has built-in web browsers that can be opened by saying, “Alexa, open Silk” or “Alexa, open Firefox.” You can use the on-screen keyboard on these browsers to type a URL, search and watch web videos, and visit your favourite website. Like other browsers, you can bookmark your favourite websites for easy access. On Echo devices with screens, you can enable Alexa captioning, magnify the screen, toggle colour inversion, and choose between colour correction options. You can also enable the VoiceView screen reader to use gestures to navigate the screen and hear spoken feedback about the items you select. Tap to Alexa makes Alexa available to customers who are not able to interact with Alexa via voice, such as customers with speech impairments. The Echo Show is available on Amazon.in starting today and will start shipping immediately. It joins the Echo Input, Echo Dot, Echo, Echo Spot and Echo Plus to create the Echo family of devices.